Add innovative features to your sites with these powerful plugins from Apple, Google, Mozilla and more! 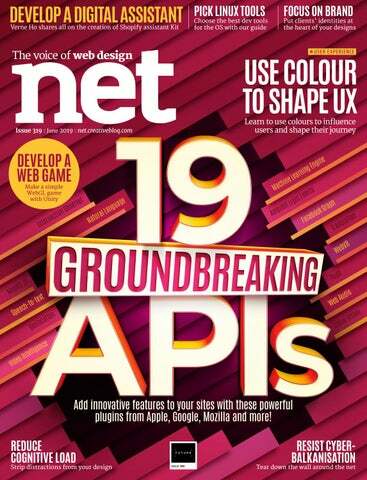 profile 19 of the most groundbreaking APIs available, so you can add awesome functionality developed by giants like Apple, Google and Mozilla to your sites. But that’s not all we have to offer. We’re also taking a look at the role colour can play in your designs and how picking the perfect palette can help you optimise your user journey. Additionally, we run down how you can reduce the cognitive strain your designs place on users. And, in the first of a two parter, we show you how you can use Unity to create a WebGL game that can be published on multiple platforms without any hassle. Enjoy the issue! Disclaimer All contents ÂŠ2019 Future Publishing Limited or published under licence. All rights reserved. No part of this magazine may be used, stored, transmitted or reproduced in any way without the prior written permission of the publisher. 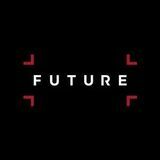 Future Publishing Limited (company number 2008885) is registered in England and Wales. Registered office: Quay House, The Ambury, Bath BA1 1UA. All information contained in this publication is for information only and is, as far as we are aware, correct at the time of going to press. Future cannot accept any responsibility for errors or inaccuracies in such information. You are advised to contact manufacturers and retailers directly with regard to the price of products/services referred to in this publication. Apps and websites mentioned in this publication are not under our control. We are not responsible for their contents or any other changes or updates to them. This magazine is fully independent and not affiliated in any way with the companies mentioned herein. If you submit material to us, you warrant that you own the material and/or have the necessary rights/permissions to supply the material and you automatically grant Future and its licensees a licence to publish your submission in whole or in part in any/all issues and/or editions of publications, in any format published worldwide and on associated websites, social media channels and associated products. Any material you submit is sent at your own risk and, although every care is taken, neither Future nor its employees, agents, subcontractors or licensees shall be liable for loss or damage. We assume all unsolicited material is for publication unless otherwise stated, and reserve the right to edit, amend, adapt all submissions. RC: No way! Exhaustion certainly isn’t the goal. A design sprint is simply a way to reduce the risk of bringing something new to the market, improve a failing feature or can be seen as a replacement to the usual ‘discovery phase’. I personally haven’t found resistance to calling it a design sprint within an organisation, as it sounds similar to a development sprint. However, I know in the enterprise space they’re often called other things such as concept projects. Resistance may come from the business not being ready to try a new way of working or adjusting their calendars. That’s why sharing the outcomes is so important and demonstrating opportunity cost. A design sprint can be a quicker and cheaper way to understand whether an idea or solution has any merit at all. at all. I realise I need to be more proactive and go out and find people but don’t really know where to start. What do you advise in terms of first steps? digital agency. Some other agency owners (a little boastfully) have told me that they rarely need to look for new business, because they get so much repeat business and word of mouth. As a rule of thumb, do you think that’s what all studios should be aiming for and, if so, what sort of timescale is reasonable to expect that to naturally happen? Global thinking DF: Locality should not be considered an issue. A digital agency should aim to be working on a global landscape; after all, a website is created for the world to see. Time zone neutrality At Fishtank we have a nice blend of UK and international clients and with modern technology we negate any issues of time zones using applications like Slack, Asana, BugHerd or Google. DF: I recognise your concerns and the comments you have heard are true of ourselves at Fishtank. It does not matter how great you think you are, in my experience tendering is a waste of time. Our success rate has been poor to the point we now won’t take part in any tendering opportunities. We now strictly focus our energy on customers who require our services. Equally don’t sell yourself short and stay true to the premise of why you created the business. When starting Fishtank 10 years ago, there was a gap in the market and we were able to bridge the void between designers and developers when creating engaging and functional digital platforms. Consequently, we created some sterling websites and associated marketing strategies. The word spread and referrals came very quickly. There is no time frame on this. Be the best you can be when the opportunity presents itself and the next project will follow. Point of difference We are based in rural West Yorkshire but this works in our favour. The general association with London agencies is that regal brands with obscene budgets often run campaigns over an extended period. But not all projects can be campaigns and these agencies are not always interested in singular projects due to their various financial commitments. Order Hotline 0344 848 2852 *TERMS AND CONDITIONS: The trial offer is for new UK print subscribers paying by Direct Debit only. Savings are compared to buying full priced print issues. You can write to us or call us to cancel your subscription within 14 days of purchase. Payment is non-refundable after the 14 day cancellation period unless exceptional circumstances apply. Your statutory rights are not affected. Prices correct at point of print and subject to change. Full details of the Direct Debit guarantee are available upon request. UK calls will cost the same as other standard fixed line numbers (starting 01 or 02) or are included as part of any inclusive or free minutes allowances (if offered by your phone tariff). For full terms and conditions please visit: bit.ly/magtandc . Offer ends 31 May 2019.